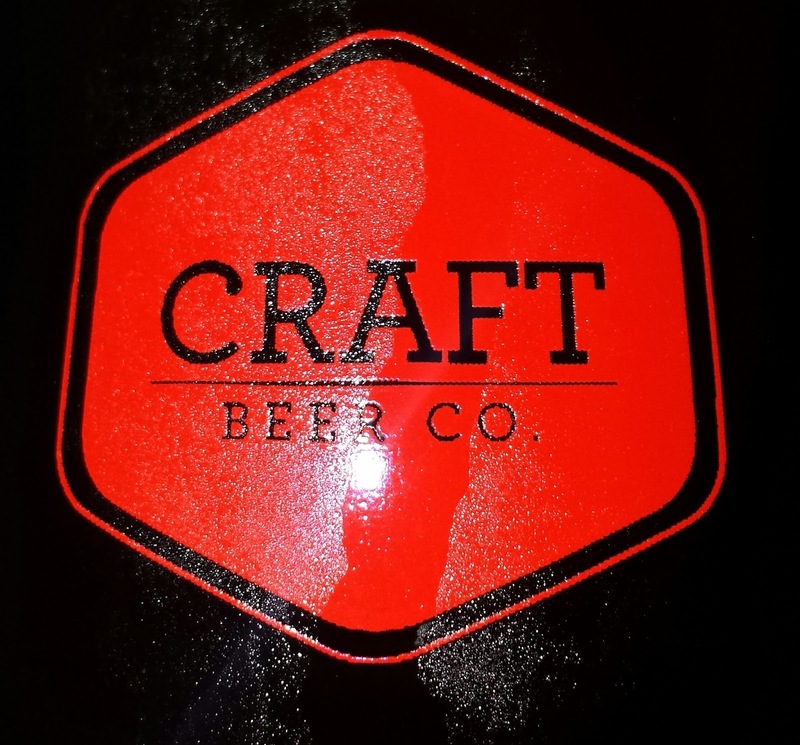 Craft Beer Company EC3 – MostlyAboutBeer…….. Yesterday, the latest in a successful pub chain opened to the public right in the centre of London’s financial district. It’s in the shadow of Norman Foster’s gherkin skyscraper. The gleaming structure seems to grow as the darkness comes on. These are my thoughts. I’ve incongruously inserted my biased tasting notes from 4 beers in the text too. The Craft Beer Company has come a long way since 2009. I went to its original venue – the Cask & Kitchen in Pimlico in the same year and recall 4 or 5 beer engines (I remember I had a pint of Titanic Brewery’s Red Ensign). The venue has gained enormous strength. 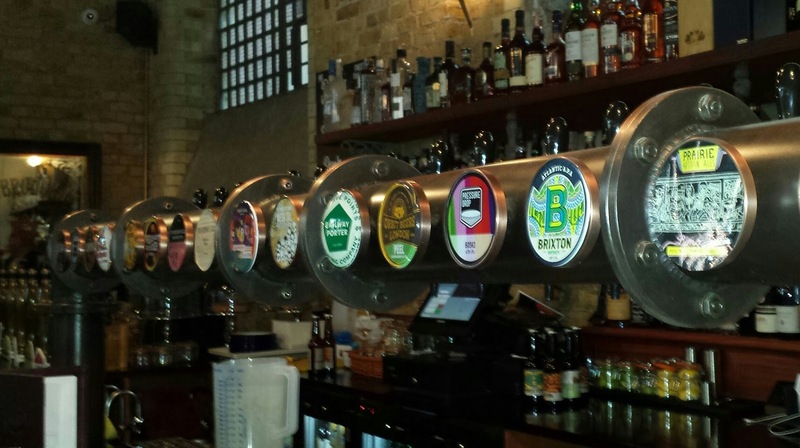 It now boasts 10 beer engines and 15 craft taps as well as a portfolio of bottles. It proceeded to expand to premises in Farringdon, Brixton, Clapham, Islington, Brighton, Covent Garden and now St Mary Axe in east London. I associate this part of London (despite the tragic background of St Mary Axe) with one particular drink: Champagne. It’s all about the financial markets and it makes me think of a 1980s film poster starring Michael J Fox “The Secret To My Success”. He’s sitting on a Champagne fountain over the Big Apple. Over the past decade, Champagne – or fortified wine – has come within the grasp of the traditional Special Brew drinker and lost its lustre. That void has been filled by beer (which incidentally has more than filled Champagne’s original price bracket). 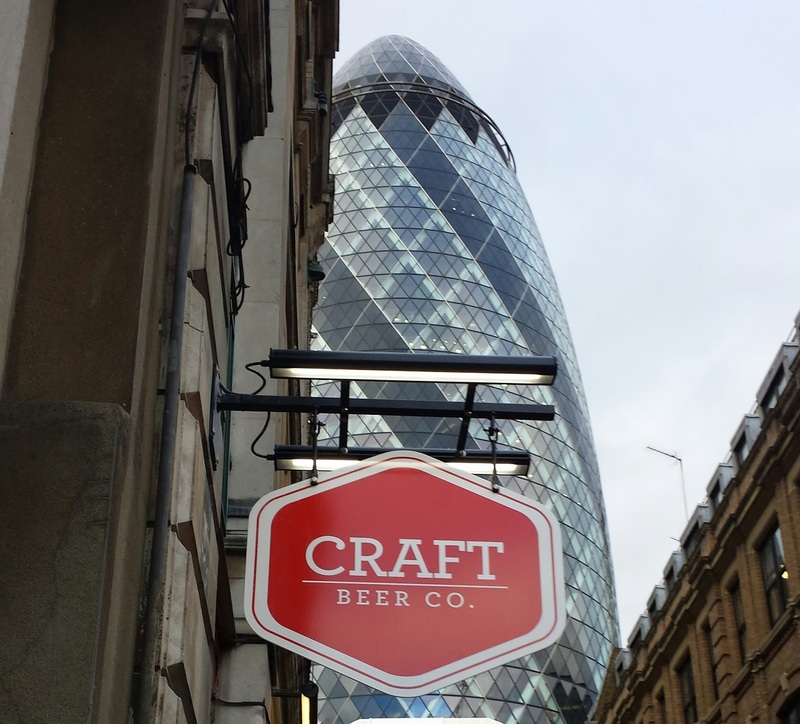 The Craft Beer Company has a £65 bottle option and I wonder whether that might meet its nexus here under the Gherkin. When I visit one of the Craft Beer Companies I have three potential ways of drinking: By brewery, by style or by opposition. I’ll explain: the cask beer engines often display a new brewery’s whole output in one go. 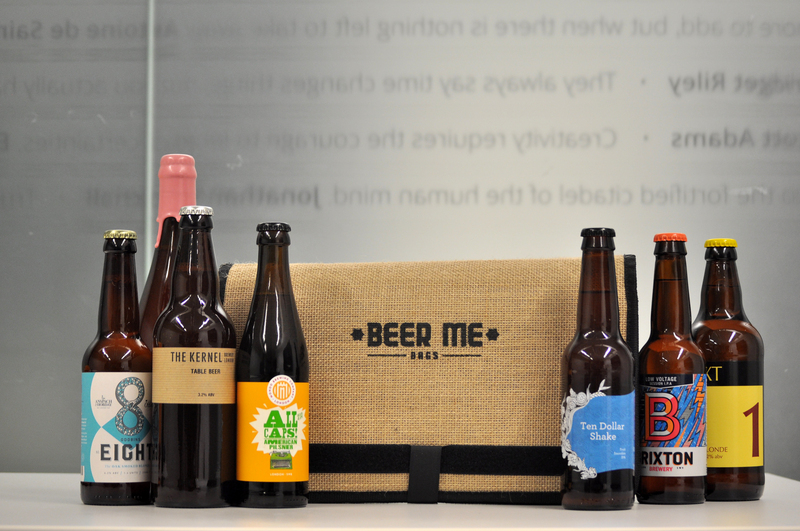 You can taste all their beers to see their own interpretations on styles – almost as good as visiting the brewery itself! The second choice reflects the number of beers on offer. I could, if I wanted, drink just stout and slake my thirst from cask, keg and bottle and experience the benefits of all three dispense methods. The third option is the opposite of the last choice – vary your choice wildly. Go from porter to Saison to bitter to wheat beer to IPA to brett to milk stout to fruit sour. The last option is the one I always take to give my taste buds a comprehensive rogering. I also find that it makes a style’s attributes shout louder as they’re in contrast to the last beer. My first half in the new Craft Beer. It’s a beer that gave me pause for concern as it seemed to pour cloudy. This fear was banished within 20 seconds as it glowed clear bright. It’s of a blazing orange. It has a deep needy orange peel bite to it. The ingredients (unlike most modern IPAs taking their cue from the US or NZ) are all British – well, almost. One of my favourite things about the Craft Beer Company chain is I often overhear people at the bar. They seem worried as they scan the array of beers like unknown insignia on an alien console. Nothing is familiar. I hear the question “do you have anything like Guinness/Stella/Strongbow (delete as appropriate)?” and in my mind I imagine a new journey. Somebody opening their eyes to good beer for the first time and becoming more critical towards mass marketed booze. The prices here seem to reflect the prices in the other Craft Beer Co venues. It also has a strong WIFI connection particularly in relation to its cousin in Covent Garden. On its maiden day, the following breweries were represented on cask and keg: Kent (they make the house pale ale), Burning Sky, Dark Star, Siren Craft, Fyne Ales, Acorn, Harbour, Rothaus, Thornbridge, Kernel, Partizan, Galway Bay, Beavertown, Five Points, Orbit Beers, Pressure Drop, Brixton, J.Wakefield (a new one for me), Beer Here, Against the Grain and Prairie Artisan Ales. There was also Lilley’s Cider. This is based on a Belgian blonde ale and brewed beneath a railway arch in Kennington. It has a musty straw & lemon aroma and is the colour of light lemon curd. It tastes stronger and more alcoholic than it actually is. Vapour from its coolness actually deflects off your face. Grapefruit edge. The mouthfeel has a deep malt like chewed corn on the cob. The ground floor space is wood floored and panel-ceilinged with small wooden tables and stools. Ornamental pillars add to the class. The windows reach all the way up to the roof. The floor would be a sun trap were it not for the fact that the building’s situated between skyscrapers. The bar is quite wide but easily engulfed by an end-of-work crowd. There’s little space between queuing at the bar and backing into the furniture. The downstairs lounge is equally glamorous but quieter. The floor and ceiling match the ground floor and all the seating – chairs, settees and stools – are made for comfort. It’s better lit and better proportioned than the downstairs lounge in Covent Garden. Brewerania adorns the walls in the form of mirrors from Bass, Allsop, Worthingtons, Ushers and others. In keeping with other Craft Beer venues, the toilets are vintage vertical lever Crapper TM (or at least the gents is). This beer is a similar red to the leather on the furniture here. It has a milky lacing. There’s an aroma of strawberries and red liquorice strings. It’s really fruity – quite plummy but without the tartness associated with that fruit. Well carbonated & refreshing. This new venue has offered something unthought of: a draw towards the financial sector of London and the weird thing is that the majority of punters here yesterday were in fact beer geeks like myself. There were shirts, suits and braces but they were outdone by T-shirted bellies and facial hair. Completely clear pale gold beer. It smells like a malty chocolate stout. It has a smooth creamy mouthfeel. On the palate it has limes and cocoa powder. It’s fluffy and forgiving. I had the fortune to speak to Tom – the guy in charge of beer for the company (he did mention his actual job title – I forgot it). He divulged that the Burning Sky Plateau was about to run dry. It was a firkin – 72 pints. It had only been drawn since just before midday that day and I was there just five hours later. I looked around. The most popular tipple seemed to be pints of pale ale or lager. I heard a bizarre question by a man overwhelmed by choice: do you have a weak lager? This question incurred brain storming from the newly trained staff. Beer is a great equaliser. I noticed that whether the clientele were travelling beer geeks or the local financial services workforce, it all boils down to the same: You move along apologising for your elbows, find your friends and session beers. Nothing has changed.